In today’s news cycle chock-full of sound and fury, humanity’s ongoing climate crisis gets pushed from the headlines. However, over the past few weeks, very troubling news about Earth’s climate broke. Simply put, we are running out of time to avert climate disaster. And while climate change (especially of this magnitude) will adversely affect everyone, it has barely made a blip in our national discourse. On September 28th, the Washington Post reported the Trump Administration is assuming a 7F increase in global temperatures by 2100. This projection is in line with other scientific models, which anticipate similar temperature increases by the end of the century. Shockingly, the Administration’s projection was part of a document written to justify freezing the Federal fuel efficiency requirements, which would increase greenhouse gas emissions. Essentially, the Administration’s draft impact statement argues there’s no point in reducing greenhouse gas emissions as catastrophic climate change is inevitable. Never mind that light duty vehicles make up 60% of the US’s transportation-related greenhouse gas (GHG) emissions and 17% of the US’s total GHG emissions. It’s important to note, however, a temperature increase of 1.5C would still have significant consequences. Earth is currently 1C warmer than pre-industrial levels. Yet, we’ve already seen intensifying hurricanes, year-round wildfire seasons and extreme drought (think California’s drought was bad? Three years of drought coupled with inefficient usage nearly caused Cape Town, South Africa – a modern city of 4 million – to run out of water earlier this year.) 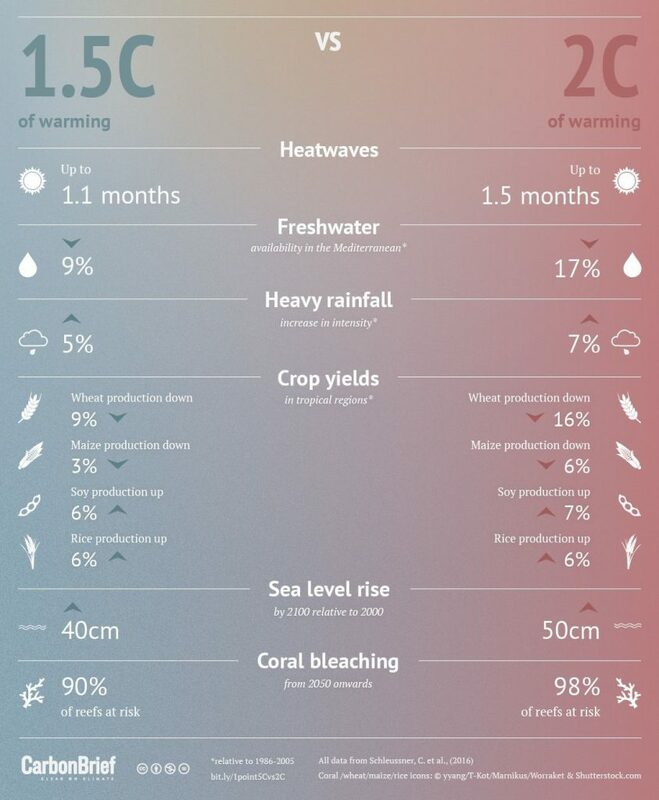 According to CarbonBrief, a 1.5C increase in global temperatures would still result in an additional month of heatwaves, worsening freshwater scarcity, and reductions in certain crop yields. Additionally, 90% of Earth’s coral reefs will be at risk for coral bleaching and dying off. As dire as this sounds, the situation would be even worse with a 2C increase (3.6F) in temperature (not to mention any increase higher than 2C). While the costs of limiting climate change are great, clearly the costs of inaction are far greater. Time (and climate change) waits for no one – so let’s get to it! Climate change has already happened and is going to continue to worsen, especially if we do nothing. That is why it’s important for all of us – as a society and as individuals – to prepare for a changing climate and to transition to a more sustainable economy and way of life. Consider California, for example. While California’s climate policies are by no means perfect, in many ways they set the world benchmark for climate action. For example, due in part to the work of the Charge Ahead California campaign and SB 1275 (de León), California is on track to have over 1.5 million electric cars on the road by 2025, and recently committed to having 5 million EVs by 2030. To achieve these goals, all economic sectors will need to work together to install charging infrastructure and design incentives so that all Californians have access to electric vehicles. Similarly, by passing SB 100 (de León), California has committed to 100% clean electricity by 2045. Though not the biggest emissions source, electricity is still responsible for 16% of California’s greenhouse gases. 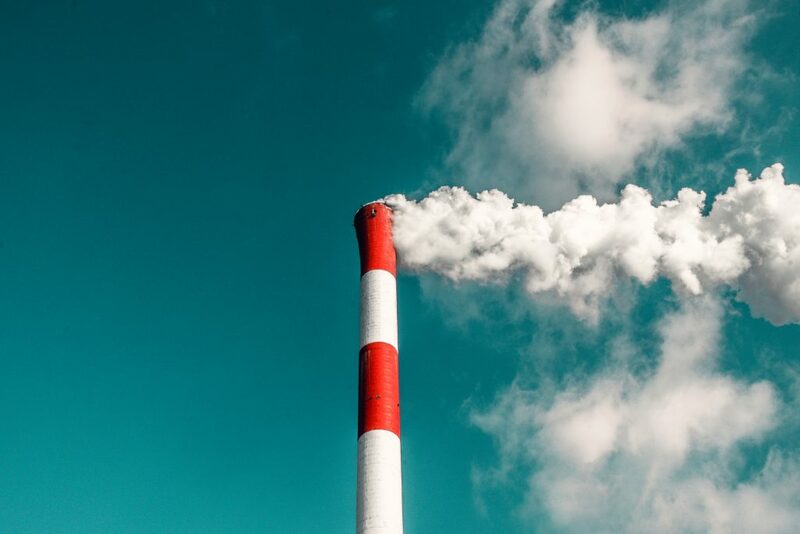 And through the work of the Coalition for Clean Air (CCA), the California Climate Equity Coalition and many other advocates, a significant portion of California’s climate investments must be directly spent in low income, environmentally-burdened communities. These communities are the most vulnerable to climate change and will feel its effects first. Contact your elected officials and local agencies about the importance of climate action and demand enforcement against polluters. When it comes down to it, the Trump Administration was right about one thing: we can’t stop climate change. But that doesn’t mean we can’t act to minimize it. In fact, we must act to minimize it – and we must act now. This entry was posted in Clean Air, Climate Equity and tagged climate, Climate change.